» Searching for Josh Smith: Who Are the NBA’s Least Efficient Shooters? From teamwork to athleticism to intellect, basketball manifests the best humanity has to offer. While we all have our own obsessions within the game, I love the sequence that commences the moment a shot leaves a player’s hand. 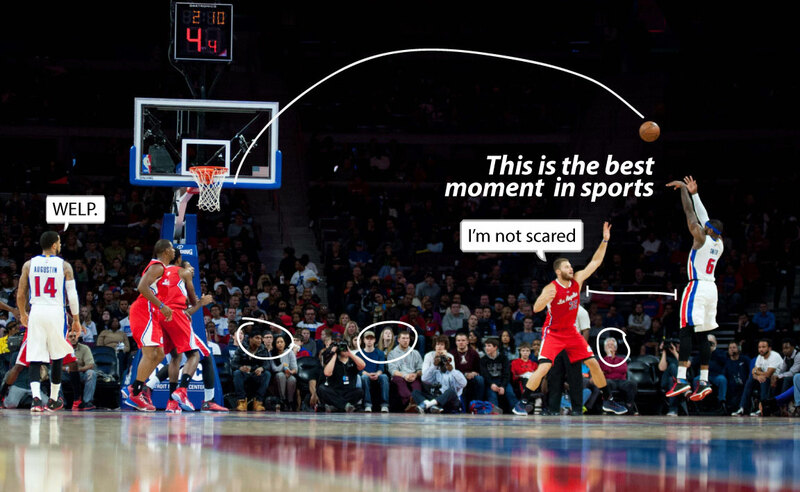 Everyone in the gym’s attention shifts, and nobody knows what might happen next: The shooter says a little prayer, rebounders simultaneously track the shot’s flight and jockey for position, and fans get to experience a brief moment of suspense. If the shot goes in, great — more points. But if the shot misses, the game totally changes form as rebounders fight for possession. This post-shot, in-between state is gorgeous. When Stephen Curry takes a shot, we can reliably expect for the ball to go in and the chaos to never arrive — which is why I love Josh Smith. Just more than 70 percent of the time he releases a 3-point shot, a future rebound gets its wings. The split second after a Smith jumper departs his left hand is like young love: emotional, fleeting, and magical. However, since his move to Houston, things have changed, and I’m a little worried that the Rockets have ruined Josh Smith. He hardly ever takes those patented long 2s anymore, and for reasons that remain unclear, he is suddenly exhibiting above-average shooting efficiency from a couple of spots on the perimeter. WHAT IS HAPPENING?!? I mean, look at that corner 3. I miss the good old days when Smith literally shot himself out of a guaranteed NBA contract. It seems as if the Rockets have “fixed” Smith, and much like the NBA’s decadelong search for the next Michael Jordan after MJ’s retirement, I’m looking for the next J-Smoove. The majority of this search has taken me up and down every lottery roster, but as luck would have it, a handful of future Smiths might even be getting some time come the playoffs. Without further delay, here are the least efficient shooters in the NBA. • Carter-Williams is the only player to take at least 200 midrange shots and make fewer than 30 percent of them. • Of the 202 NBA players who have attempted at least 100 3s, Carter-Williams ranks 200th in field goal percentage. In other words, he’s not quite Mark Price. The Bucks hope that Jason Kidd, who knows a thing or two about fixing a crooked jumper, can inspire the Carter-Williams reconstruction project. 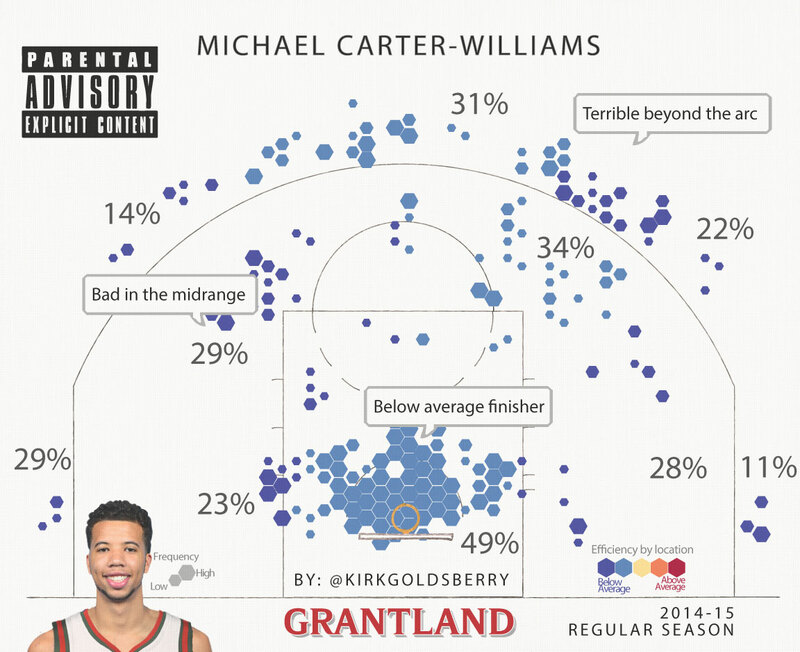 While there’s little doubt that improvements are possible, the current state is quite bleak: Jump-shooting guards have never been more important in the NBA, and Carter-Williams is a horrid shooter from virtually every spot on the floor. Parental advisory: The following graphic contains explicit imagery that is not suitable for young children. With a nice group of young players, the Utah Jazz have the makings of a strong defensive team built around a suddenly beastly rim protector in Rudy Gobert. On the other end, the Jazz have one of the least effective finishing guards in the league: When Burke attacks the rim, opposing interior defenders morph into Gobert. 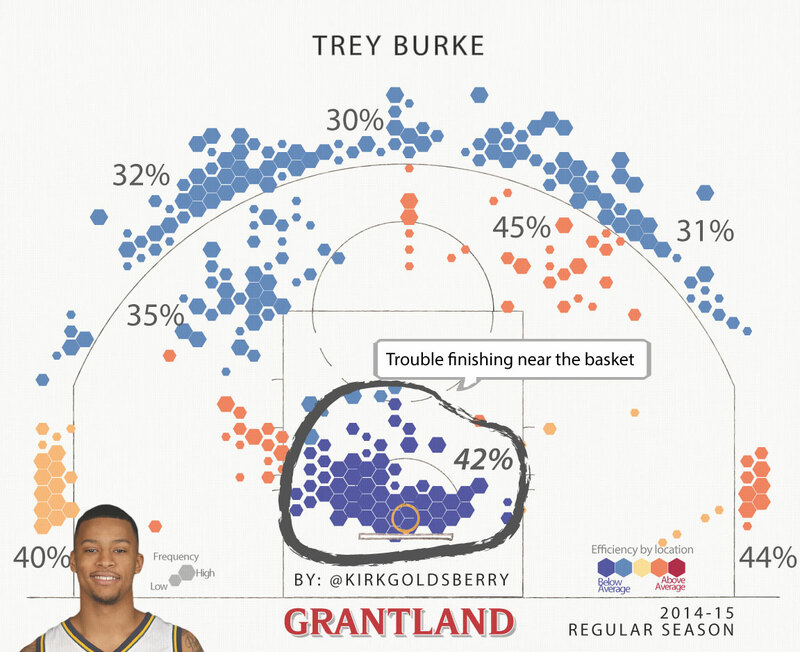 This season, 167 players have attempted at least 200 field goals inside eight feet, and Burke is the second-least effective among them, converting a measly 42 percent of those close-range shots. But fear not, Jazz fans, for improvement is possible: Just ask Curry, who was really bad near the rim earlier in his career, only to turn into a very good close-range finisher. If Noel continues to improve at his current pace, he is going to be a productive player for a long time. It’s clear he has what it takes to be a difference-maker on defense, but to turn into an effective offensive player, he has to become a better jump-shooter. 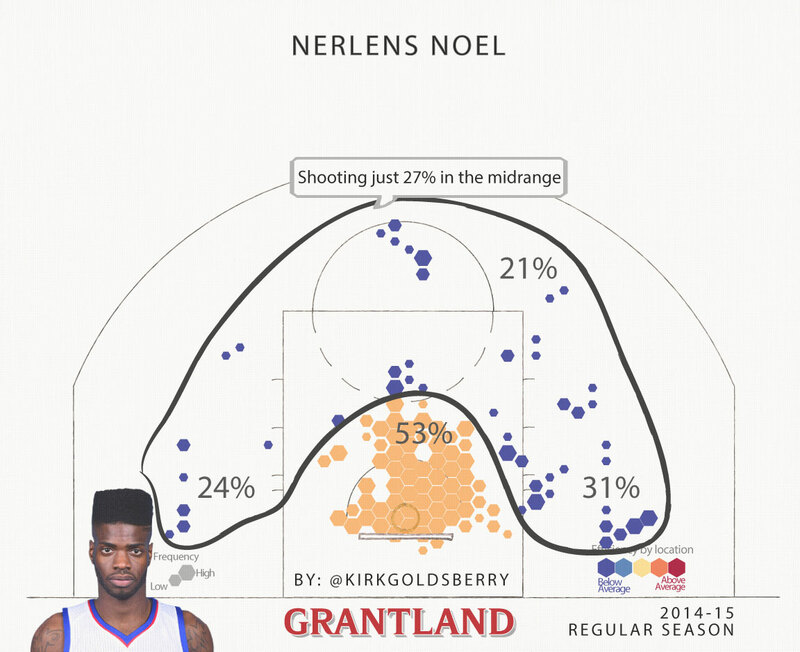 As of Monday morning, 205 players had attempted at least 100 midrange shots, but none converted at a lower rate than Noel’s 27 percent. If he wants to be a great NBA player, this has to change. 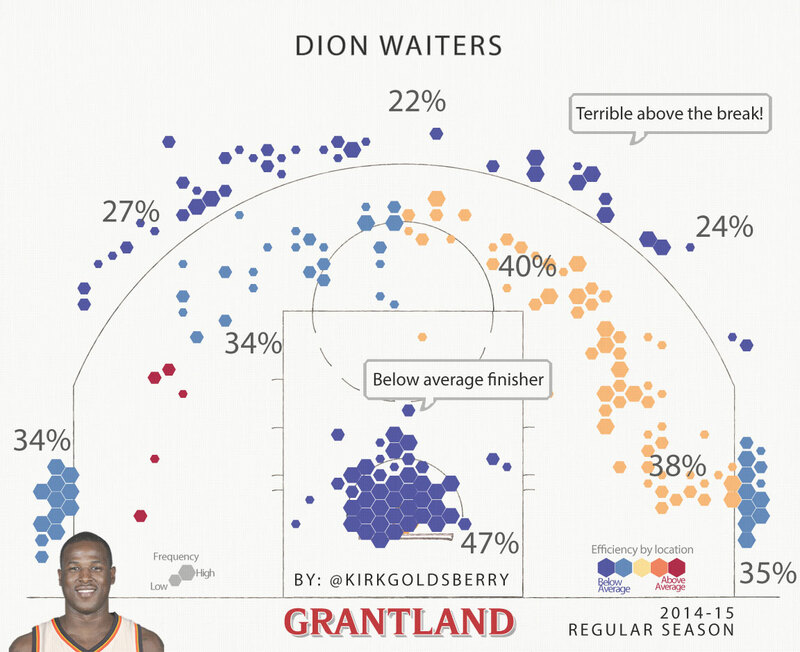 Waiters is not only among the worst statistical 3-point shooters in the NBA, he also supplements his impotent blend of volume and inefficiency with an overflowing amount of unearned hubris and terrible defense. What’s not to like? If you’re looking for Waiters Island on a map, it’s right in the heart of Pacific Proving Grounds, where the U.S. tested nuclear weapons from 1946 to 1962. Nobody is allowed to go there anymore, as the islands are too contaminated — just like the blue archipelago along the perimeter of Waiters’s shot chart. As it turns out, there can only be one Josh Smith. While none of these four players quite matches the vintage Smith’s bulk brick-launching, I truly believe that Waiters will be the closest thing we’ll have going forward. So if you have a missed-shot fetish like I do, come meet me on Waiters Island. We’ll have the whole place to ourselves.